FBT Audio is proud to announce the new addition of their professional line array loudspeaker in Qube loudspeaker system family FBT Qube QSA 112.0A Line Array Speakers. 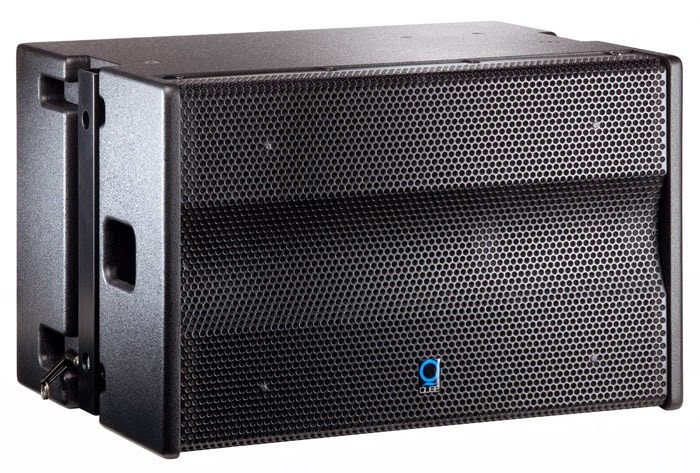 Specifically designed for large line array apllication, the Qube QSA 112.0A is very ideal for J shape array system configuration and capable to throws out an impressive SPL level to cover end point of any long distances. QSA 112.0A is a compact 2-way active line array loudspeaker system,transducer component utilize a B&C 12-inch high excursion LF woofer and three unit of 1-inch exit throat with 1.7-inch voice coil HF tweeter, all comes with powerful yet light weight neodymium magnets and coupled into three waveguide modules to provide 100 degree horizontal and 5 degree vertical coverage dispersion. As a bi-amped loudspeaker system, the QSA 112.0A loaded with a 1100W high efficiency Class D audio power amplifier for the LF section and a dedicated 300W Class G for the HF. For system set up, the QSA 112.0A has equiped with accessible dipswitches function with factory default pre-sets to configure the EQ contour for environment ,also with eight different delay settings at the second section dipswitches. The other additional features includes : Gain level adjustment from - 9dB to + 3 dB, four LED indicator to provide visual operation status, ground lift switch, balanced XLR Female input, balanced XLR Male through output, auto resetting AC line circuit breaker, two AC connectors using Neutrik Powercon one for main AC input and another 1 for AC loop out to supply up to 3 additional QSA 112a speakers in the same bar. The cabinet built from ¾-inch Baltic birch plywood, each of QSA boxes is finished using scratch and scuff resistant paint material and features ergonomically placed handles and also mechanical hardware with 10:1 safety factors. Completely Built Up in Italy. 2 way Bi-Amped self powered & processed line array system. 12-inch B&C high excursion with neodymium magnet LF woofer and three-inch large diaphragm HF tweeters with 1.7-inch voice coil coupled to three waveguide modules with 100° H x 5° V coverage dispersion. 1100w Class D audio power amplifier for LF + 300w Class G power amplifier for HF,with capability of generating 139 dB peak SPL each cabinet. DSP audio controller with 8 factory default EQ pre-sets to setting up the system and additional 8 delay line settings. Speaker cabinet constructed with 18 mm (3/4-inch) 13 ply Baltic birch plywood, internally braced to prevent any unwanted sound resonance. Finished using a scratch & scuff resistant black paint. Two ergonomic carrying handles and solid mechanical hardware to facilited suspension system with 10:1 safety factor. FBT Qube QSA 112.0A Line Array Speakers now available in your nearest prosound dealer.